Mala, being Mala, said, “What if we take turns asking a burning question that we’re curious to hear everyone else’s responses to, and then take turns responding to each other’s questions?” You can argue whether what Mala offered is a “game” (it’s not). But for whatever reason (answer: social justice inner nerd times 10), that’s the “game” (it’s not a game) that we chose to “play” (it’s not a game). 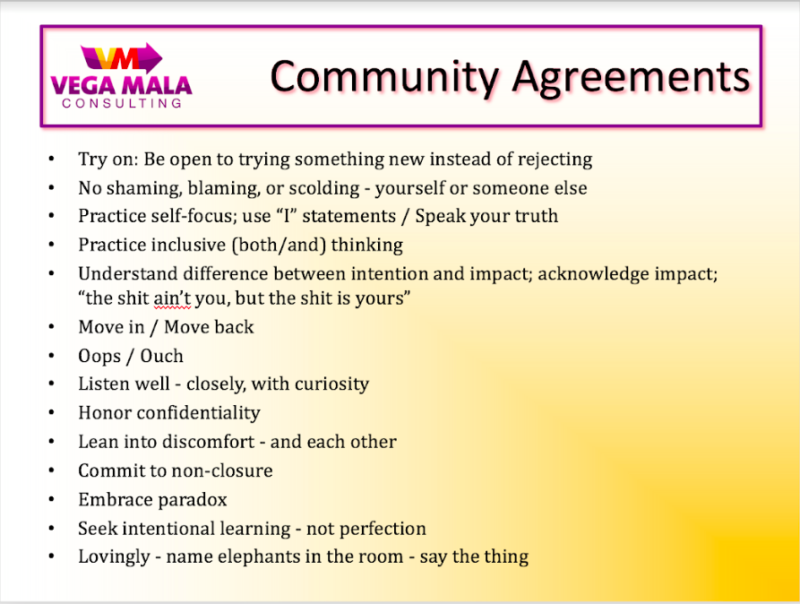 The question I posed was, “how do you feel about ‘community agreements’?” You know, those things listed on flip chart paper at the beginning of facilitated work and activist gatherings? That is, for me, indeed, a burning question. It’s not clear to me that the dozen or so go-to agreements mean anything anymore. Sometimes when I hear participants call them out – “oops/ouch,” “move in/move back,” “use ‘I’ statements,” etc., – I wonder if they’re even listening to themselves, or simply going through the motions. It can feel like the people in the room are just checking a box before they can move on to the “real” work. As often as not, the agreements live passively on the wall, never to be considered again. Some would say that it is enough that we go through the exercise, simply as a reminder of the atmosphere we’re trying to co-create. But I have to wonder why the agreements are almost always hung juuuust out of the line of sight, if not buried under all the other flip chart paper. It’s not clear to me that merely writing a list of “rules” or “agreements” leads to actual behavior change. That is, do people actually behave differently because of the agreements? Is there someone thinking, “Welp, now that I’ve committed to these agreements, I guess I won’t be close-minded and judgmental after all”? Will the person inclined to run off at the mouth find a way to stop themselves, in real time? I’d love to see the research on this. Is there research on this? Some agreements sound good in theory but are impractical for anyone who is a human. “Keep an open mind,” for example, or “stay present,” might be a laudable ideal. But in a given meeting or retreat, it’ll be broken again and again and again. …And, and this is the trickier but perhaps vastly more urgent scenario, it’s not clear to me that facilitators know how to draw upon them to extract difficult conversations when they notice an elephant in the room. …Come again? But…isn’t that the whole purpose of the agreements? To be able to have the difficult conversations, challenge someone, communicate anger, in a productive way? Why would we worry about oops/ouch or shaming/blaming except to allow for tensions to rise and be navigated fruitfully? My fear is that community agreements freeze rather than provoke courageous conversations. That when someone either disagrees with or is offended by a statement or posture, the community agreements make them averse to vocalizing their disagreement or offense. If we are to go through the exercise, how can we do them differently? Bring them to life? Give them more potency? How can we deploy them the moment the elephant appears in the room? Or when tensions flare? What other solutions might there be for us to co-create a vibrant, conflict-welcoming, inclusive meeting culture? I want stories. When have you experienced community agreements being used skillfully? When have you experienced community agreements saving a potentially explosive situation? When have you seen the lack of community agreements lead to a situation going south beyond recovery? What have you experienced that breathes fresh new life into a practice that surely continues to exist (passively or not) because we yearn to be heard and have an impact? Leave a comment, so we can learn new ways of agreeing AND disagreeing together. Thank you for naming this. I’ve often been told that I should be doing this as a facilitator but rarely do for the reasons you’ve mentioned – primarily that it feels like just words and stuff everyone should know and I’m not sure if it really makes a difference. Interestingly, a client recently asked for ground rules partway through the meeting so we circled back and spent a moment on it. What I took away from that is for that particular type of workshop, it’s really important that people have a shared understanding that the discussion is a safe space and what we discuss won’t leave the room. Now I make sure that this expectation is stated much more clearly up front. Building on that, I can see that if something genuinely needs clarification, it’s helpful to do that up front. I’m also intrigued/less skeptical about the idea of ground rules that are more tangible and therefore perhaps easier to create accountability around (like “3 and me”), though haven’t tried this out too much myself. But other than that, I remain skeptical. Would certainly be interested to hear about others’ experience. Thanks Jenny. Your comment got me wondering how “community agreements” can be used more broadly than just during meeting facilitation. Are there orgs that are using community agreements as part of their organizational culture? If that makes sense? I also want to hear more stories!! As someone trying to help my organization navigate conflicts, political, personal, and beyond, this is something I’m very curious about!! Thanks for startin and starting the Convo!